We present the famous Jamón Serrano. This vacuum-packed sachet of 150 grams of product, contains an excellent Jamón sliced by machine that you can use to prepare sandwiches or tapas. This Jamón Gran Reserva, from a white pig, is the best Jamón you can find within this type of quality, try it today and let yourself be surprised by its flavour! At Enrique Tomás we offer you a delicious Jamón Gran Reserva, which after 18 months of curing has a mild taste that represents the first step in quality of our variety of cured Jamón. Also known as Jamón Serrano, this product is made with white pigs from our region fed with feed and cereals and perfectly cured, which gives it a slightly salty taste perfect for more informal occasions. Enjoy it in our whole piece, knife, machine or boneless formats. Our Jamón Gran Reserva comes from the hind leg of the white pig, which has been cared for and fed on farms based on feed and cereals, which gives its meat a smooth taste, with simple and slightly salty nuances, making the whole quality of a properly cured Serrano ham to be perceived on the palate. Enrique Tomás' Jamón Gran Reserva comes from Segovia. What is a Jamón and how is it made? A jamón is the result of dry curing a pig's hind leg in salt. Depending on the type of pig and its diet, the months of curing vary substantially and its taste will also vary. Due to the large amount of meat in the same jamón, we will find different flavours: the “maza” is the softest part, the “contramaza” the tastiest and as we approach the bone we find more intensity. Once we have the pig's leg ready, the first thing we have to do is prepare it for salting. The “cook” (the expert as we call them here) makes a v-cut on the pig's rind and decides how much external fat to leave. The more fat the leg has, the less salt it absorbs and the sweeter it gets. Once the previous operation has been performed, the leg is buried in salt for an average of two weeks. If the cook decides to extend this period, the jamón will be tastier. From that moment on, depending on the type of jamón we are going to make, the characteristics of the leg and the flavour we want to obtain, the leg will be hung in the special celler to dry until it is optimum for consumption. At Enrique Tomás we want jamón to be present in your home and that is why we offer you a whole range of Iberian products in the most comfortable and practical formats you will find on the market. Vacuum packed sachets: 80 grams of the best Iberian products. The quantity is ideal for you to enjoy the jamón, paleta (ham shoulder) or sausage at its ideal point, without the fear of not eating it in time and drying it out. An unbeatable way to encourage you to try a product without having to buy large quantities. 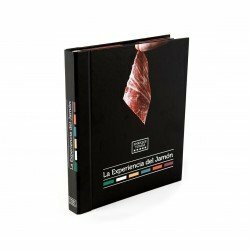 Packs: in Enrique Tomás we also offer the possibility of buying different savings packs and "travel" packs in which you will not only find a way to save, but you will also have the security of having all the Iberian ham or ham shoulder you want in comfortable vacuum packs to be consumed at your own pace and whim. Boneless piece: if you have your own slicer at home, we offer you the possibility of buying the best Jamón Ibérico, boned by our experts, so that you can finish slicing yourself, in the comfort of your home. Whole piece: for experts and Jamón lovers, nothing better than a good “pata” at home to cut, eat and share. You can also get a whole Jamón Ibérico and enjoy all its flavour as a Jamón artist. Ingredients A jamón is the result of dry curing a pig's hind leg in salt. Depending on the type of pig and its diet, the months of curing vary substantially and its taste will also vary. Due to the large amount of meat in the same jamón, we will find different flavours: the “maza” is the softest part, the “contramaza” the tastiest and as we approach the bone we find more intensity. Instructions Remove the sachets a few minutes before consumption and wait until they are at room temperature. A very easy way to know that the product is ready to be enjoyed is when the slices are easily separated without breaking. This is the perfect moment when this product has regained all its nuances of flavour, texture and aroma.